Caputo’s Bake Shop occupies the first and second floor of a white-brick building at 329 Court Street between Sackett and Union. If you live in Carroll Gardens, you know this bakery quite well. In fact, the Caputos may even know you. Their long, striped yellow bread bags with the bold blue capped CAPUTO’S font may be the most recognizable logo in the neighborhood. And if someone sent you on a scavenger hunt to find it, you wouldn’t be limited to the bakery alone. Caputo’s not only boasts of a successful retail business, but of a thriving wholesale business as well. They distribute their breads, of which there are over 100 different varieties, to stores all over Brooklyn. They are, without a doubt, the men with the bread. Meet John and James Caputo - father and son. Established in 1904 by John’s father and grandfather, the bakery was originally opened for business on the southeast corner of Union and Hicks before it and adjacent buildings were demolished to make room for the construction of the Brooklyn-Queens Expressway. John’s father was the baker and he did everything by hand in an old-fashioned slow mixer. They sold three breads: plain, seeded, and scalita (a dry Sicilian bread that goes best with soups, I learned). Home deliveries were big then and so frequent trips were made by horse and wagon around the neighborhood, running up stoops with bread baskets. “Families ate a lot of bread - five to ten loaves a day!” John says. Today, however, Caputo’s is one of the two standing traditional Italian bread bakeries in the neighborhood (the other being Mazzola’s on the corner of Henry and Union). 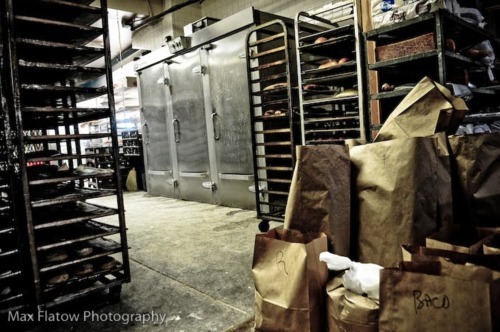 A day-to-day business with preparation beginning around four or five o’clock in the afternoon, there are doughs that need to be started one day and finished out the next and then there are some that are baked out in one day and put under refrigeration. Some doughs take three days to prepare. However, it’s during the holiday season when the Caputo men really need and require the most help from their staff. “Even then, it’s not enough,” the both of them agree. This father and son duo have a fairly straightforward business motto that has been around a long, long time: KEEP THE PEOPLE HAPPY. They’re a neighborhood bakery that caters to its inhabitants - always has, always will. “One of the reasons why we changed our mix of breads was to accommodate all of the young, new people who were moving in,” John explains. “Fifteen years ago, bread was still a popular thing… but they came wanting the new breads - the kaiser rolls, the brioche, the olive.” He lets out a little smile and says, “They thought they were gourmets.” [Side note: the olive bread is my favorite bread there.] “But that’s why we’re still here,” John says. “We bake what the people want. If we depended only on the basic items we sold forty and fifty years ago, people would pass right by.” And pass right by, they do not. Not when you have baguettes and ciabattas, olive breads and onion loaves, rusticas and semolinas stacked warm and pretty in the window.